Com2Us’s ultra-Korean Puzzle Family (Free / $1.99) is now available worldwide. It’s full of crazy-fun minigames, but to get in on all the fun you’re either going to need to pony up some cash, or invest some substantial time playing. Here’s the deal: you start out with three of the game’s eight minigames available to play. One is unlocked for free, one is unlocked by connecting Puzzle Family to your Facebook account, and one is unlocked by signing into Com2Us’s gaming hub. If you want to unlock anything else, it’s going to cost you stars. You can earn stars by playing the games (but slowly), or you can pay to get them in larger amounts. Unlocking all eight games is going to take a serious investment of your time, or more than a couple of your hard-earned dollars. So if you’re someone who wants to pay for a game upfront and have it all available to you, give this one a pass. But let me just say one thing first: Puzzle Family is really, really fun. Most of the minigames are takes on matching games, but they’re interesting takes. If you can resist the siren song of IAP, you can easily get by with the three unlocked games in the free version and have a lot of fun while slowly working towards unlocking the rest of the content. Flick and Fly, the included game, is a match-3 style game where you flick grumpy-faced blocks into each other to make and clear matches. They’ll slide until they hit something, so setting up combos takes some (quick) thought. Hide and Seek also has you matching faces, but these ones are two-sided. Tap them to flip them around and swap their colors to make matches. In Shanghai Pop you’ll match pairs of blocks, but they have to either be touching or be free on one side. Order the Order, which gives you a three-symbol pattern to find in the field. Who’s Next, which has you locate three different colors of critters in ever-increasing numerical order. Boing Boing, which is pretty much Puzzle Bobble. 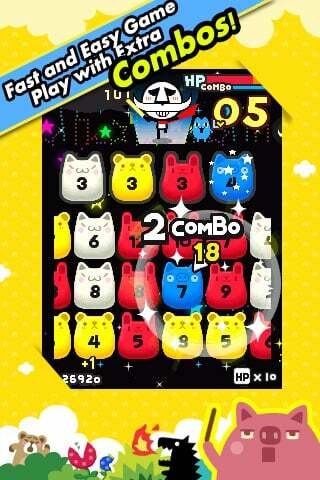 Copy Copycat, a flipping puzzle that needs you tap squares to flip those around them and match a specific pattern. Tap on Time, a timing game about tapping the right square at the right moment. They’re all wrapped in Puzzle Family’s colorful, haywire style, with lots of cute and completely ridiculous imagery. And they’re also very fun. You’re on a tight timer in all the games, with either time or HP running down whenever you stop making matches or miss your timing, so they always feel frantic. In a pinch you can use a skill, which gives you a little more HP or time, but be warned – in the free version of the game, you can only earn them back by viewing ads, and in the paid version you can earn them back at a rate of 10 per day. That’s the main difference between the paid and free versions of Puzzle Family, by the way: ads. There aren’t any in the paid version. You also get 3000 stars to start with, so you can unlock a couple more games. If you like the game, I’d recommend going for the paid version sooner than later, since your progress doesn’t seem to carry over – it’s a better deal than buying the stars in the shop. The metagame aspects of Puzzle Family are a little lacking. There is no Game Center integration, just Facebook leaderboards. The urge to earn stars helps offset the lack, though – a high score is nice, but earning a ton of stars is much more satisfying. Even once you’ve unlocked all the minigames, you can use your stars to buy dress-up items for your stick-figure avatar, and those items give you more HP, higher scores and such. Your scores also feed into an experience system, of sorts – each “level" moves your little Puzzle Family to a new home. They start off living in the gutters, so there’s nowhere to go but up. I can see why Puzzle Family is so popular: there’s lots to see and do, I’m always stimulated, and the stars do a great job of hitting the “reward" switch in my brain. So far our forum users are loving it too. I do wish the game were less mercenary in its approach, but if you pay, you’re paying for a collection of very fun games. Few of them would stand on their own, but all eight together make an argument that’s hard to resist. Wow! 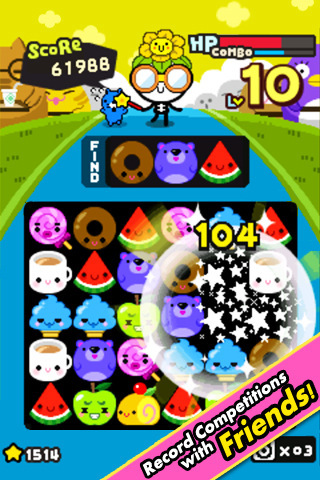 Puzzle Family brings twitch game action and excitement in 8 delightful puzzle games!